The Oakland Athletics busy offseason continues. Today they sent shortstop Yunel Escobar to the Washington Nationals. 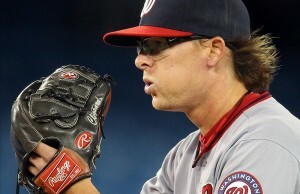 Jon Heyman of CBS Sports reported the deal and speculates that relief pitcher Tyler Clippard will be going to the A’s. Escobar was traded from the Tampa Bay Rays to the A’s just this past weekend. The Nationals gain a lot of flexibility by acquiring Escobar. Most likely he will supplant Danny Espinosa at second base. Incumbent shortstop Ian Desmond will be a free agent after this season, and Escobar is controlled through the 2016 season for $13 million with an option for 2017. Escobar had a down season in 2014. The 32 year-old shortstop, who is typically a solid defender, recorded awful numbers by both UZR and Defensive Runs Saved. For the most part he’s been regarded as a solid defender, and is a good bet to rebound from 2014. At the plate he produced a .258/.324/.340 batting line, which was a downturn from the previous season. He played through shoulder and knee problems, and the Nats hope that he can bounce back with those problems behind him. By trading Escobar, the A’s are likely putting their trust in middle infielder Marcus Semien, who was acquired from the Chicago White Sox earlier in the offseason. Of course super-utility man Ben Zobrist, who was acquired from the Rays along with Escobar, can also play shortstop. Most likely Semien and Zobrist will comprise the A’s double play tandem. Clippard would add to the A’s solid bullpen. The 29 year-old has a career strikeout rate of 27.6 percent and posted a 2.18 ERA in 2014. He’s set to be a free agent after the season. In his career with the Nationals he’s been primarily a setup man, though he served as their closer in 2012. The A’s have had a very intriguing offseason. Early on they signed designated hitter Billy Butler to a three year pact. They followed that move up by dealing away star third baseman Josh Donaldson, ace pitcher Jeff Samardzija, and middle of the order bats in Brandon Moss and Derek Norris. In exchange they received several younger players along with Major League ready talent in Marcus Semien and Jesse Hahn and the talented but oft-injured Brett Lawrie. While the A’s may have appeared to be rebuilding, this looks like more of a roster overhaul with the intention of competing in 2015 and beyond. They aren’t as strong as last season, but with the acquisition of Zobrist and several other players, they are in good position to compete. Throughout the offseason they have added young players with years of team control, which should extend their window of competition or give them more pieces to trade.